It is the morning of Saturday January 16 2016 a sunny day in Taiwan, people are out to do what they usually do during the weekend despite it being the Election Day in the country. Charles Li Director General Taipei Economic and Cultural Centre in Chennai who had come to his homeland to vote, is on his way to the polling booth “Everyone here gets on with their own business during the election day. The only new thing they do on an election day is that they cast their vote. Once they perform this duty it is just like another day,” he said. Things happened just as he said as the Election Day in Taipei was a normal day. There are no processions or any other show unlike in Sri Lanka. The voting pattern is somewhat similar to Sri Lanka. The people have to take a chit when they go to the polling booth. This document contains the place where a person has to go to cast his or her vote. This is just like a poll card in Sri Lanka. However the voters are given seals of three different colours. This year the two elections, namely the presidential election and the general elections were held on the same day. Accordingly they were given three seals. One seal is to vote for the presidential candidate of their choice and the others for the general election. Each voter casts two ballots, one for the district and the other for at-large-seat. The Legislative Yuan consists of 113 seats. A striking feature in the polling booths is that both men and women queue up together unlike in Sri Lanka where there are separate queues for men and women. Unlike in Sri Lanka the voter has to caste the vote in the constituency he or she belongs to, even the public servants as there is no such thing as postal voting in that country. The election is held on a Saturday so that granting leave for employees of an establishment does not become a necessity. The requests given by the Commissioner of Elections to grant leave for employees of private and public sector is unheard of as in the case of Sri Lanka. The voting starts at 8 a.m. and ends at 4 p.m. as in the case of Sri Lanka. The other novel thing as far as Sri Lanka is concerned is that results are out by 6 p.m. and what is amazing is that the atmosphere is quiet. One does not hear fire crackers as you hear them in an election night in Sri Lanka. The final result is out at around 10p.m. The usual scenario is that the winning party holds a rally and then goes in for a press conference. Post election violence is unheard of. However there are some similarities when it comes to Sri Lanka as there was some election related violence. There was 1.797 of them according to a national newspaper - Taipei Times. These include vote buying and gambling rings on vote results and gambling on election results. However those who have been responsible have been charged by the Supreme prosecutors. The raids are carried out both by the prosecutors and the police. This is in contrast to Sri Lanka where election law violators get away scot free. Another distinct feature is that campaigning continues till the eve of the elections. But one cannot see walls covered with posters and rows of cut-outs on the side of the road. There are several differences compared to Sri Lanka when it comes to transfer of power to the winning political party by the outgoing party. 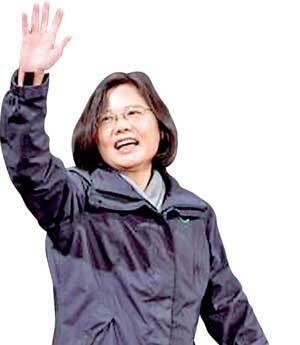 According to the Taiwan constitution there is a transitional period of four months. During this period the party elect or the president elect and the outgoing party and the president cannot take and implement major decisions. The outgoing party has to hand over the reigns gradually. This gives the opportunity for the outgoing party and the president to complete any unfinished work. The policies which were highlighted in this year’s election were foreign ties. Actually the people seem to have accepted the policy of Democratic Progressive Party ( DPP) which promised to develop international ties across Asia, including the Indian sub continent. The winning DPP obtained more than 60 percent of the Legislative Yuan. This was highlighted by DPP Secretary General Dr Jaushieh Joseph Wu who said earlier that his party if elected will strengthen ties with Asian countries including those in the Indian sub continent.